The penultimate episode of the series tonight and another IP packed show. It was one pitch in particular which grabbed both mine and the Dragons’ attention. If my friends asked me to go camping there would only be one thing on my list of things I would need and that would be new friends. But, after watching tonight’s episode of Dragons’ Den I might have had my opinion of camping changed. 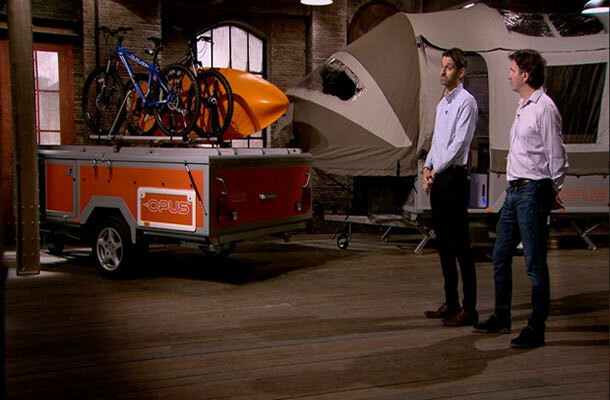 Jonathan Schofield and Jonathan Harrison towed their Opus Camper into the Den to try to persuade the Dragons or more specifically Deborah Meaden to part with £80k for a 5% stake in their start-up business. The Opus is a trailer which you can tow behind your vehicle to transport bikes or sporting equipment. When you arrive at your destination you unhitch and within 20 minutes it transforms into a spacious and very comfortable looking camper. It is fully equipped with 2 double beds, sitting area and dining table and kitchen area. It is even high enough for the 6 foot 7 inch Peter Jones to stand up straight in. I have never understood the appeal of sleeping in a muddy field (you would need to talk to my fellow Dragons’ Den blogger Louise if you wanted a chat with a camping enthusiast), but if anything could persuade me that camping could be fun it would be the Opus! I was sure that the camper would contain a lot of IP. On further investigation, it seems that the duo knew this too. They have patents granted and pending on the way the Opus works as well as trade mark protection for their brand name. I was also interested to see that they had registered community designs to protect the look of the camper itself. Very important for the pair as they had designed the camper, from scratch, themselves. You can protect the look of your product in the UK for as little as £60 with a registered design. This covers all aspects of the design including the appearance, physical shape, configuration and decoration. The registration gives you exclusive rights for up to 25 years and if someone was to ever copy or steal your design, it would make taking legal action more straightforward. Even if you choose not to register your designs you may still have automatic unregistered rights. Many designers rely on their unregistered Community design right. This offers automatic protection for the unique appearance of your product and lasts 3 years. This starts from the date the design was first made available to the public within the EU. Here at the IPO, we have just finished consulting about the fees we charge for registering designs. Many designers told us that the cost of applying to register designs and the subsequent renewal fees was an issue. The fees for applying for a UK design weren’t in line with those at other national offices, including those for the Registered Community Design. We were proposing to reduce many of our fees including reducing the cost of applying for 3 designs on line from £140 to £70. You can read more about our proposals for changing the fees in blog post by Lynda Adams our head of designs’ modernisation. We could only really be in the UK...I enjoy working with people who have had an idea and need help to make it become a reality…I didn’t come on the show to become a salesman for someone’s minor subsidiary. When thinking about trading overseas, it’s also important to think about how this will impact on your IP. Just because you have registered your trade mark, design or patent in the UK this doesn’t give you automatic protection overseas. Fortunately, there is lots of help available to help you. The IPO have produced country guides to help you navigate the IP systems in specific countries. We also have International attaches based in China, Brazil, India and the ASEAN region who are there to help you with your international IP concerns. Luckily for the 2 Jonathans it was only Nick who was really worried about the lack of opportunity overseas. The rest of the dragons were all very keen to set up camp with the businessmen. But it was Deborah Meaden and her experience in the camping and caravanning industry that the two had been hoping to secure with their pitch all along. Despite Peter Jones’ obvious disappointment it was no real surprise when they accepted Deborah’s offer. Protecting your IP can help you grow your business as we’ve seen with the Opus camper in tonight’s show. If you’re not sure where to start with understanding all the different IP rights and how they might affect your business, a great place to start is with our IP Basics animations . These 12 short films give you bite-size, easy to understand information about everything to do with IP. We’d love to know what you think of them. Hello, I'm commenting from a UK based student support service. We have a large number of students who use our services and we see IP being a common issue for many design and engineering students who simply aren't taught the complexities of IP during their courses. I've had a look through GOV.UK but I can't find any specific student oriented material on IP - could you tell me if any such information exists? We are looking to compile an easy to understand guide to IP for students, particularly for recent graduates who are frequently exploited for their enthusiasm and new ideas by corporations and small businesses alike.